Many trends in sales automation will be game changers. Among those, social selling and the impact of LinkedIn Sales Navigator to Dynamics 365 users are trends to watch. The integration between LinkedIn Sales Navigator and Dynamics 365 has a lot of potential can bring several benefits to the sales team if used correctly. Before we discuss LinkedIn Sales Navigator and Dynamics 365, let’s have a look at what social selling is all about. So, what is social selling? Why is it so important today? Social selling is the process of salespeople using social media by tapping in their social network and engaging and building trusted relationships with the right prospects or leads in a medium that has the right balance of automation and personal touch. Social selling brings the sales function into the digital world and is customer-centric. Social selling allows salespeople to establish their professional brand by actively communicating in various online communities in their industry. It enables them to build trusted relationships by sharing posts such as relevant case studies to common pain points encountered by those in their industry and showing how they successfully handled them. Doing this positions you and your company as subject matter experts to the right prospects and gets you valuable leads that have a higher conversion rate. With people allocating more time on their mobile devices and social media, social selling plays a valuable role in sales and marketing. Social media is where customers reside these days, so let’s engage them where they will best get responsive leads. LinkedIn is a leading social media networking website. It is one of the most effective social networks for selling, if not the most effective. Microsoft buying LinkedIn may look like just buying a social network. But Microsoft has bought something more—they purchased one of the most influential, highly specialized, and constantly read professional networks. It gave Dynamics 365 users access to the vast professional network of LinkedIn and allows them to get targeted audiences for marketing campaigns. 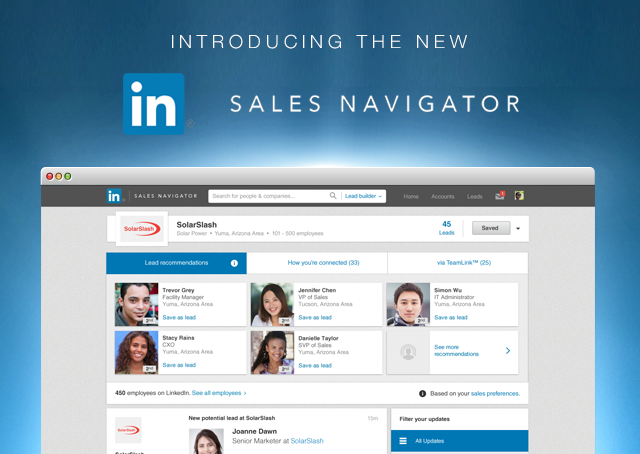 The primary social selling tool in LinkedIn is Sales Navigator. Sales Navigator allows the sales team to tap into the robust social media platform provided by LinkedIn. Sales Navigator improves social selling by guiding salespeople with valuable suggestions and insights. It helps them pick which organizations are current opportunities from their social network. They can find hidden decision makers, increasing the probability that leads will convert to opportunities and get them much-needed sales. Of course, these leads and opportunities will be managed inside Dynamics 365, making LinkedIn a natural extension of Dynamics 365 and a solid platform for social selling. Sales Navigator is available for desktops, laptops, or mobile devices. Here are some of the features of Sales Navigator that give value to any organization. LinkedIn Sales Navigator is a very powerful tool for lead management and social selling. Although LinkedIn walks users through the setup process, here are a few things to remember. They need to import their leads and target accounts and companies to Sales Navigator. They will want to select the territories and job functions. They should remember to use Lead Builder to filter lead searches. When searching for relevant accounts or companies, they can search by keyword. Lastly, they should monitor and manage lead engagement. This helps users understand if they are excelling or if they need improvement. LinkedIn Sales Navigator integration with Dynamics 365 gives any organization improved performance in their sales processes. This is because they are utilizing all the vast information available on LinkedIn’s public profiles. The direct integration between Dynamics 365 and LinkedIn Sales Navigator is just one of the first few steps in many enhancements, capabilities, and features that will immensely differentiate and give leverage to Dynamics 365 over other competitors. When LinkedIn Sales Navigator is used together with Dynamics 365, it offers a lot of benefits for any sales team. Below are some benefits gained from LinkedIn Sales Navigator and Dynamics 365 integration. Aside from these benefits, there are also some features that can assist the sales team of any organization. With LinkedIn Sales Navigator, organizations are starting to unleash the full potential of Dynamics 365 on social selling. There are more buyers and influencers involved with buying decisions, and the majority of buyers use LinkedIn for research before engaging with any sales team. LinkedIn Sales Navigator platform together with Dynamics 365 is a match made in heaven. It is specifically made to support salespeople with social selling. This perfect combination provides vital insights for leads and accounts and allows organizations to engage with customers earlier in the sales process, providing them with relevant information at critical times. Sales teams only need to set aside some time each day to engage in social selling. They need to make it a part of their daily sales routine, and sooner rather than later, they will see results. Microsoft bought LinkedIn in 2016 which gave Dynamics CRM an unfair advantage over its competitors. It also brought new and exciting integration and opportunities for any organization’s sales team with Dynamics 365 via LinkedIn Sales Navigator. What value does that deliver to Dynamics 365 users? Dynamics 365 integration with LinkedIn Sales Navigator helps sales teams become masters of social selling in no time. It gives them the leverage to increase their organization’s sales and helps them better manage their relationship with existing customers. LinkedIn Sales Navigator and Dynamics 365 will be a very formidable tool for success in this social selling era if organizations want to stay ahead of the curve.